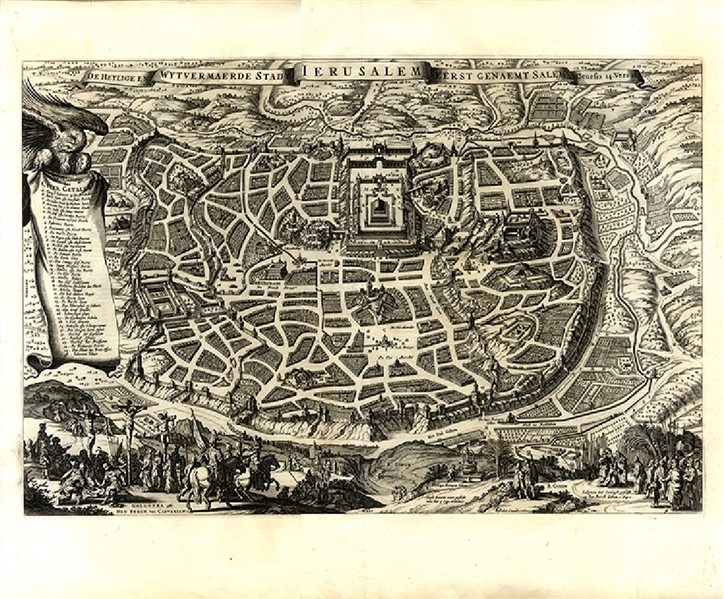 titled “Die Heylige en Wytvermaerde stadt Jerusalem Eerst Genaemt Salem, Genesis 14 vers 18”, 20” x 16”, drawn by Nicolaes Visscher I (1618-1679), published Jacob Lindberg, Amsterdam, 1702. Copper-engraved bird's-eye view of Jerusalem, with several engraved vignettes of hebraic artifacts and people on the outside of the wall. Well-engraved and attractive with a key listing 40 points of interest. On the lower right “Golgotha” (Calvery) depicts the execution of Jesus. In the center is Temple Solomons. Another image depicts jesus on the road to Emaus. Printed in Dutch language with descriptive information on the reverse, "Beschryvinge van Jerusalem." . Near fine. Striking Bird's-eye view of Jerusalem . Includes a key locating 36 important buildings. Jerusalem is illustrated as reported in Genesis 14, with a scene showing Solomon in the foreground and the Crucifixion of Christ on Mt. Cavalry in the lower left.